Ipe Wood is also called Brazilian Walnut, a quite famous wood material that is used in building decks and is considered exotic because of its looks and physical characters. Elements that are made out of Ipe wood are usually strong in nature and are resistant to mold, rot, or weather. They are mostly found in darker brown to medium brown in color. Following are some of its characteristics. Strong in nature, yet flexible. Can last up to 75 years depending on the surrounding. Smoother in nature, which gives it an exotic look. Ipe was tested by the U.S. Naval Research Laboratory for its resistance to termites. To test the wood, they put the Ipe underground for 15 years. It resisted all termite attacks for the entire period. There is no other wood in the world that has been able to duplicate this result. Ipe is one of the top 10 hardest kinds of wood in the world according to the Janka hardness test. Combine that with the resistance to bugs, splinters, decay and mold and you find that mother nature has made the perfect wood for outdoor use such as decking. Ipe Lumbers come in many sizes and can be adjusted in accordance with customer’s demand. This lumber comes with the light to dark olive brown color with a little greenish caste. With often lighter or darker streaks. You can use this lumber for the construction of different kinds of furniture. It can also be used for construction such as decking, flooring or some sort of industrial use. Can be made available in different forms and sizes. Heat, insect, mold and weather resistance, meaning it can be used for building. Can be used even after a long period of time. The rich dark color makes it look quite exotic. Slip Resistance to avoid any mishap. Repair and maintenance are much easier. Ipe Decking gives a very exotic look to your resident since it would be on the main display of your house from the outside. Its characteristics include a highly dense and very tight grain. The grain comes in two forms, which are wavy and straight, you can pick whichever suits your taste. However, these are not the only reasons why Ipe Decking is the best choice for you. 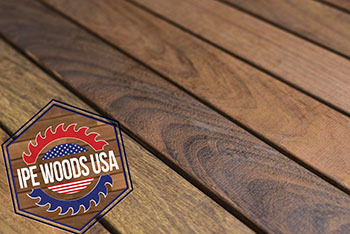 You simply cannot buy better wood at a better price than you can with Ipe. That is why we are here! You do not have to worry about your Ipe wood delivery. Why is that? Following are the reasons. Cost Effective: We only bring Ipe wood from our trusted suppliers, that also in bulk to break the cost of transportation and other expenses, which results in lower costs to our clients. High Quality: The quality of our Ipe wood is marvelous and stand on all pressure tests that we conduct before we sell any batch. Reliable: Our aim is to develop a better relationship with all of our clients, and that is only possible by winning their trust. That is why we only choose the most trustable Ipe suppliers for you. Timely Delivery: Time is the essence, and timely delivery is always necessary. All of our suppliers are properly managed by our professionals, so you always receive your Ipe wood on time!